Mar. 27, 2018 10:20 a.m. The 26-year-old Vancouver man who drove the wrong way down Highway 99 before hitting two cars on Sunday night is not expected to make it. “We’re in the early stages of an investigation” into the case,” B.C. Coroners Service spokesperson Andy Watson told Black Press Media Wednesday morning. “He’s not expected to survive. The man’s next of kin have been notified, Watson said, but the agency will not be releasing his identity due to privacy concerns. Speaking Tuesday, police said that the driver who drove the wrong way down Highway 99 before hitting two cars on Sunday night did not drive the wrong way through the Massey Tunnel, as was previously believed. Note: The language in this video may be disturbing to some viewers. “We have learned that the driver did not go through the tunnel the wrong way but went through the counterflow barriers,” Deas Island Traffic Services RCMP Sgt. Lorne Lecker told Black Press Media. Lecker said the 26-year-old Vancouver man drove the correct way through the southbound lanes of the tunnel before driving through the barriers. He then continued on, heading the wrong way, until nearly Highway 17 where he hit a Toyota Rav 4 head-on, sending a 48-year-old woman and 19-year-old woman to hospital. The 19-year-old woman is still in hospital, police said Wednesday, but is out of intensive care. A grey Honda Pilot was also hit. Both occupants were treated by paramedics on scene. The wrong-way driver remains in hospital, Lecker said, with life-threatening injuries. He remains unconscious so police may never be able to interview him. They have not ruled out impairment as a factor in the crash. Lecker confirmed police are aware of dashcam footage appearing to show the wrong-way driver on the highway. 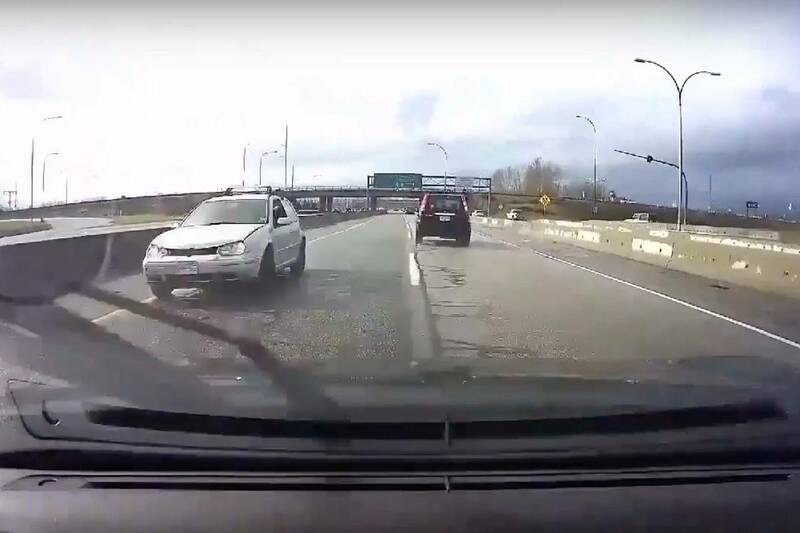 A YouTube video posted Monday appears to show an older-style Volkswagen Golf heading the wrong way down Highway 99.